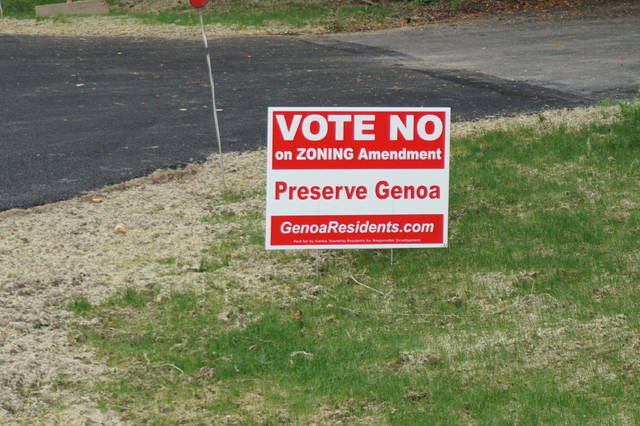 Two issues were on the ballot for Genoa Township residents. From Trustee Goodman: With this newsletter, we have turned the corner into fall. Gone are summer picnics, baseball games, and lazy days at the pool. Now we welcome football season, the last harvest of our garden crops, and curling up in front of the fireplace with a cup of hot chocolate and a good book. We also look forward to spending time with family and friends during the upcoming holiday season. On Veteran’s Day we recognize those who have served our country to preserve our way of life. Thanksgiving is an opportunity to appreciate the abundant resources available to us, and of course, turkey, stuffing, cornbread pudding, pumpkin pie….yum! • A levy to approve funding for a new police station that would provide up to $7 million dollars to be repaid in a period not to exceed ten years. More information can be found at www.GenoaTwp.com/BondIssue. • A referendum on the rezoning of several parcels of land located at 4741 Tussic Street Road. For more information, click the link on the front page of the Township website at www.GenoaTwp.com to review ballot language and records from the April 9th Trustee Special Meeting. “Cram-the-Cruiser” was Saturday, November 3rd at Kroger, 7345 Maxtown Road. This Police Department initiative was a wonderful opportunity to help those facing food insecurity. Thanks to the generosity of many, the cruiser was filled several times over! Our Fire/EMS Department is currently accepting donations of non-perishable foods, toys, and gift cards. Collected goods will be distributed to families in our area and through Big Walnut Friends Who Share. Items can be dropped off through the end of December at the Fire Station (7049 Big Walnut Road). Last year over 200 families were assisted. Snow season is quickly approaching. Many are saying this could be a year of larger snowfalls; fun at the sledding hill is in our future! Please remember to give plows plenty of room to do their job. Also, basketball hoops should be moved away from the street and whenever possible, vehicles should be moved into driveways for better clearing of snow. The Maintenance Department thanks you for your cooperation! Do you have a street tree in front of your house? If so, remember it is your responsibility to ensure it is trimmed so branches do not interfere with passing/parked vehicles and that informational signs are easily visible. I hope each of you has a pleasant and safe fall season. On July 21st, 911 operators received a call after a resident witnessed a jogger collapse. Another resident was passing by and immediately began to help by administering CPR after seeing that the patient did not have a pulse. Genoa Township paramedics arrived and continued treatment, defibrillating multiple times during transport to the hospital. By the time the ambulance arrived at the emergency room, the patient had regained a pulse and was breathing on his own. After a quintuple bypass and a week to recuperate, the patient was able to reconnect with the paramedics who saved his life. • Activation of Emergency Response – This was a witnessed cardiac arrest, with notification to 911 within seconds. 911 operators at DELCOMM processed the call in 39 seconds. • Immediate CPR – Witnesses estimated from the time the patient collapsed until citizen CPR was being performed was no greater than 40 seconds. • EMS – The Fire Department’s response or “turnout” time was 55 seconds. The travel time was 2 minutes and 29 seconds. Total from time of call to on scene was 4 minutes and 3 seconds. • Early Defibrillation – Paramedics delivered the first shock 2 minutes and 20 seconds after arriving on scene and a second shock 5 minutes later. The resident who initially began CPR had learned the skill several years prior at a class offered by Genoa Township Fire Department, but never thought he would have to put it to use. This event reminds us how important it is for everyone to know how to perform hands only CPR. Contact the fire station at 614-568-2040 to attend a CPR class, which are offered free to individuals and groups. Throughout November and into the first weekend of December, the Township will have yard waste dumpsters placed at the Maintenance Facility. Residents are welcomed to dispose of leaves, branches, grass clippings and other organic materials there. No plastic pots, bags or other trash is allowed as the dumpsters will be taken to a composting facility. When forecasters begin to predict snow, the Maintenance Department will apply brine to the roadways in advance of the storm. As snow begins to accumulate, main arterial roadways will be plowed and salted first, followed by secondary streets, and lastly, cul-de-sacs. • When shoveling, move snow to the left side of the driveway when looking at the house from the street to prevent the plow from pushing the mounded snow back across the driveway. • Move parked cars off the streets to allow for clearing from curb to curb. • Keep sump pumps working properly by sprinkling rock salt at the curb opening to prevent ice from blocking draining water. • Drivers are on-call and may have been up all night clearing the roads. Show appreciation with a wave and a smile! A normal week day for Ryan Thompson involves a commute to work and a family dinner at home in Genoa Township; a stark contrast to his life from 1999 to 2009 when he served first as a Security Forces member and, later, a Phoenix Raven in the United States Air Force. Preparing for combat the moment a plane landed, traveling to 22 different countries, and meeting high level government officials were life defining moments suddenly left behind due to a medical retirement. Transitioning into a new career proved to be difficult. “I wasn’t prepared to come out of the military,” Ryan recalled. “It took me a long time to be able to provide again for my family and that has stuck with me. It is my driving force.” After a 15 month long job search, Ryan received an offer from the State of Ohio. “That was all God.. Ironically, he became employed helping veterans break through those barriers,” said Ryan’s wife Brenna. “It was a meaningful job that he could relate with one hundred percent.” Ryan has since moved on from that position, but remains deeply involved in veterans affairs. Veterans Day holds special significance in the Thompson household as the couple’s children learn more about Ryan’s time in the military and pay tribute to the many men and women who have served. Ryan’s advice is to memorialize the veterans in your family by sharing their stories and to thank a veteran when the opportunity arises. CELEBRATE VETERANS DAY: Visit the new National Veterans Memorial and Museum at 300 West Broad Street, Columbus. Open Wednesday-Sunday from 10 a.m. to 5 p.m.
https://www.sunburynews.com/wp-content/uploads/sites/48/2018/11/web1_GENOA-NO-SIGN-1-.jpgTwo issues were on the ballot for Genoa Township residents.